This is a guest post by Kurt Elster. Kurt is the founder of ecommerce agency Ethercycle and host of The Unofficial Shopify Podcast. He lives in Chicago with his wife & three children, prefers to fly Delta, and thinks reclining your airplane seat makes you a monster. You can follow his travels on Instagram. There are a lot of competing approaches when it comes to luggage. You may want your luggage to be a status symbol, or as effortless as possible, or as big as possible, or maybe even smart. There is one conspicuously absent item from the list and that’s weight. With any luggage, weight and price are inversely proportional. Because I worry less about my luggage knowing I can afford to replace it, I’ve gone with a cheaper but heavier setup here. Even though I immediately loved the 1510 as–is, I knew I could readily improve it. As often noted in reviews, this is a one loud roller case. Turns out the wheels are the same hard plastic as the body, and when combined, the whole things transmits vibrations audibly. This is where my modifications began. I purchased a pair of 63mm inline skate wheels from Amazon for $9 and prayed the bearings and axles were standard. Removing the wheels from the Pelican is a simple affair. Unscrew the wheel assemblies with a standard Phillips screwdriver, then use a hammer and punch to knock the axles out. I immediately discovered the new and old wheels had identical bearings. The Pelican bearings appeared to be better quality, so I swapped them into the new wheels, then reassembled them. The result was as I hoped: smooth and quiet. Though the Pelican case offers loops to accept TSA locks as well as double-throw latches, there’s still a non-zero chance that case could end up open on the tarmac. 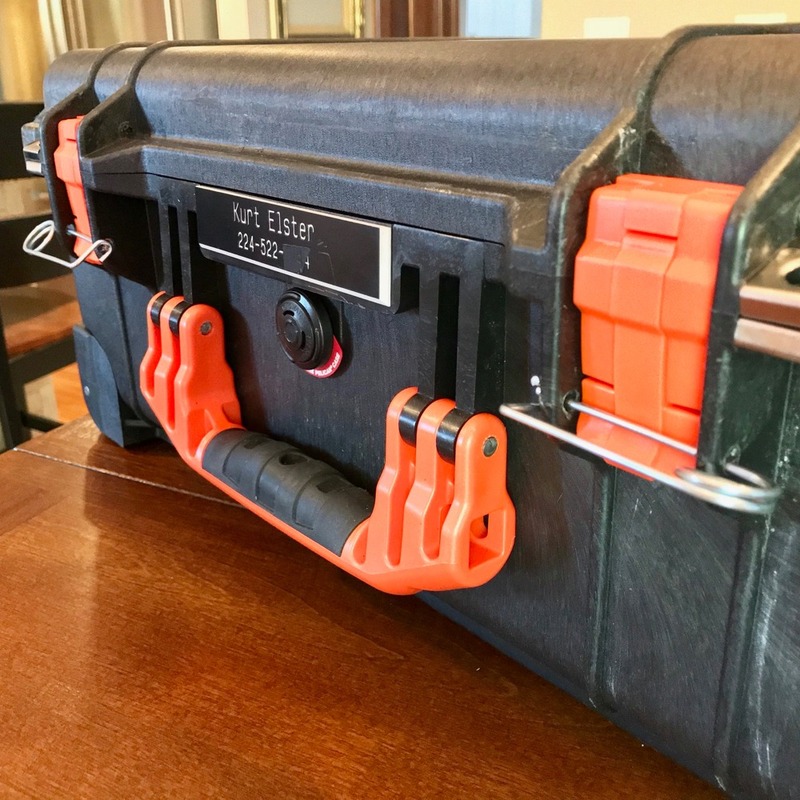 In an overabundance of caution, I drilled ¼” holes in front of the latches to accept locking pins that guarantee that latches stay securely closed when the case is handed off to a baggage handler if gate-checked. Out of the box, the 1510 comes with nothing in the interior. It’s just a plastic box. While there are a variety of options available from Pelican and others, I’ve chosen to keep mine simple in the interest of flexibility. In the top of the lid, I want to keep all of my small items like my portable sound machine or the ever-growing collection of dongles & chargers that various devices demand. 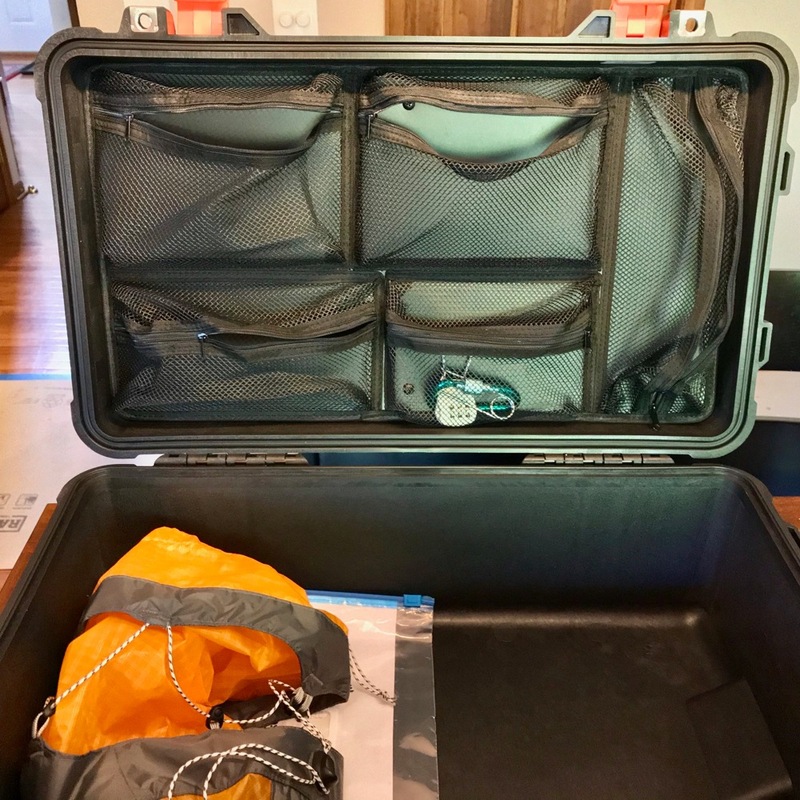 For extra space, I grabbed the Pelican accessory organizer — it’s a series of zippered mesh pockets that attached to a hard backing which screws securely into the lid. In the bottom of the lid, I’ve gone with the tried and true travel combo of a compression sack and travel cubes. Using the travel cubes as padded dividers, I can confidently throw my 15” MacBook Pro (in a rugged Thule case) and my Canon 5D into the case as well. If I wanted to be exceedingly well organized, a TrekPak divider system would provide a additional protection and organization without sacrificing flexibility. There are certainly cheaper divider options available, but none as beloved as TrekPak. To make the case less of a theft target, I wanted to be very obviously unique to me. The case accepts a nameplate so I had one made with my name and phone number. A luggage tag may disappear, a glued-on nameplate will not. Using a vinyl plotter to make a stencil, I spray painted my last name on the case. For a bit of fun, visibility, and as a nod to my Futurama fandom, I added a huge Planet Express logo sticker. 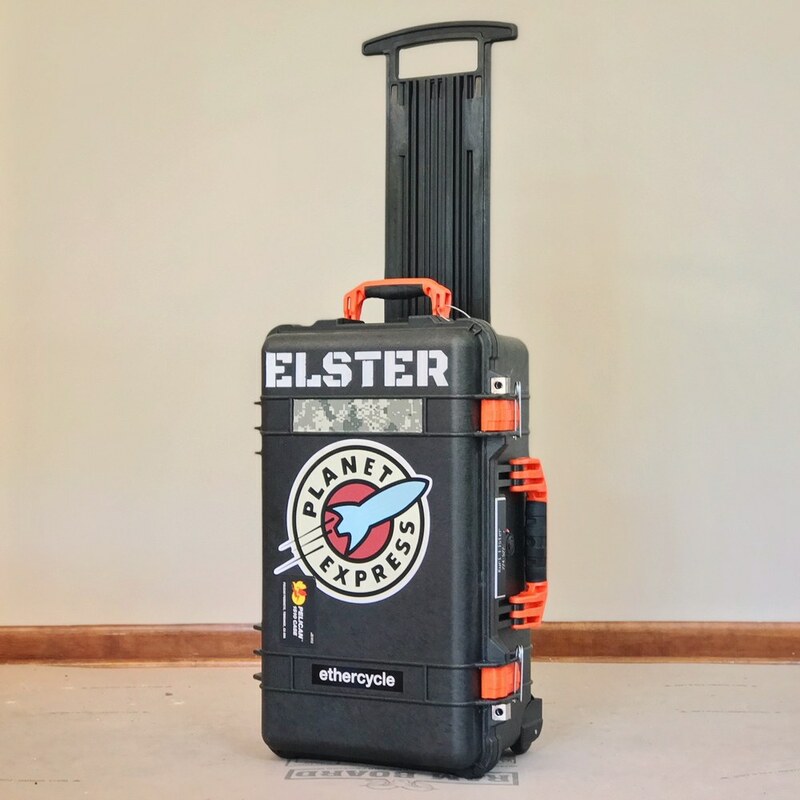 A Pelican case may not make for the lightest luggage in the world, but it is practical, fun, and unusual. Though my favorite feature of the case, though it has nothing to do with luggage, is that it will easily support an adult’s weight. It serves additional duty as its own seat in airports and train stations, and even as a step stool which I’ve used to gain new vantage points for my travel photos.